A very tasty and colorful salad that may also become a main entrÃ©e by adding chicken. 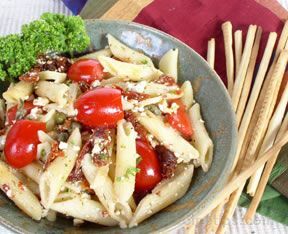 This penne pasta salad recipe works well for a summer picnic or makes a delicious selection for a special luncheon. Cook the pasta according to the package directions; drain and place into a large bowl. While the pasta is cooking, prepare the salad dressing according to the package directions and pour over the warm, drained pasta. Let the pasta cool before adding the remaining ingredients. Add the drained capers, crumbled feta cheese, chopped parsley, and chopped reconstituted sun dried tomatoes. Refrigerate for 4 to 6 hours so that the flavors of the ingredients blend together. Just before serving, add the tomatoes. Substitution: Instead of using capers, you can use chopped Kalamata olives. Optional: To use this salad as an entrÃ©e, add one chicken breast per person. Optional: Use cherry tomatoes instead of chopped large tomatoes. Note: This recipe doubles and triples easily.